South Sudan has become the fifty-fourth state on the African continent. The world's youngest independent nation is facing tremendous challenges: levels of extreme poverty remain high as hundreds of thousands of displaced South Sudanese are returning to their homeland. SOS Children's Villages will intensify its efforts in South Sudan in order to effectively protect and care for vulnerable children and young people in need. The work of SOS Children's Villages in Sudan began in 1978. Over the years, hundreds of thousands of people - especially children - had to suffer the impact of war, droughts and floods. Now that South Sudan has become an independent nation, a new SOS Children's Village Association of South Sudan will be founded. Around four million children form part of the population of this new African country. The dramatic socioeconomic situation the majority of them face makes the work of SOS Children's Villages extremely necessary. In 2004, the organisation started an SOS Emergency Relief Programme close to Malakal. The secession of South Sudan, the changes that go along with it, as well as ancient, barely subdued conflicts have caused violent conflicts and a precarious life for the civilian population. Together with other NGOs, SOS Children's Villages began a project that focused on the re-integration of former child soldiers. As for now, SOS Children's Villages is supporting South Sudanese children through the SOS Children's Village programme in Malakal, close to the border of Sudan. There, children whose families can no longer take care of them can find a loving home in one of the SOS families. The Republic of South Sudan shares borders with Sudan, Ethiopia, Kenya, Uganda, the Democratic Republic of the Congo and the Central African Republic. The country's total population is roughly 8.3 million of which more than half are below the age of 18. Contrary to its northern neighbour, South Sudan is covered by lush green swathes of grassland and characterised by a more tropical, humid climate. South Sudan became an independent state in July 2011 after six years of autonomy followed by a referendum in which South Sudan's population voted in favour of secession. The new state has joined the African Union (AU) and the United Nations (UN). However, political tensions between South Sudan and its northern neighbour remain and the security situation continues to be fragile. Oil is the main pillar of South Sudan's economy. Since independence, prices for food on local markets have gone up dramatically. More than one million Sudanese from the South are still stranded in Khartoum, the capital of North Sudan, waiting to return to their homeland. Although many international aid organisations are offering their support en route, the long trek south is a tough challenge for southern Sudanese. Both countries taken together have one of the highest numbers of internally displaced persons (IDPs) in the world. An estimated four million Sudanese have been displaced by war and ethnic clashes. In spite of the joy that greeted independence, the people of South Sudan are facing incredible challenges and dramatic socioeconomic conditions. South Sudan is one of the continent's poorest nations. According to U.N. estimates, only 55 per cent of the population have access to drinking water. Less than one in five South Sudanese know how to read and write. Like in many other African states, poverty in South Sudan has a rural face. The northern province of Bahr El Ghazal is marked by the highest rate of poor people in the country. Roughly 80 per cent of the country's population live in rural areas and depend on crop farming as their primary source of livelihood. Climate variation and natural disasters tend to have a strong impact on the living conditions of many people. Droughts and flooding can drive thousands into starvation. Hundreds of thousands live in shacks, without access to medical infrastructure, decent sanitation facilities and schooling. Due to inadequate hygiene and a lack of potable water, infectious diseases spread easily. Like in many other African states, the HIV prevalence rate in South Sudan is alarmingly high at 3.1 per cent. 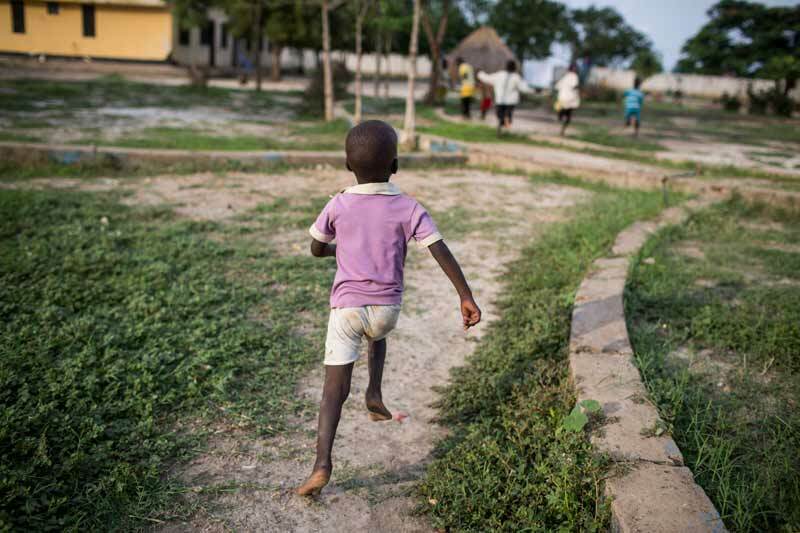 Children in South Sudan are born into a very unstable and fragile society. They are clearly the most vulnerable segment of population and need special care and protection. South Sudan is characterised by one of the world's highest infant mortality rates: out of 1,000, 102 babies die during birth or immediately after. One in nine children dies before reaching the age of five. Furthermore, about two thirds of South Sudanese children are not officially registered, which makes it difficult for them later on to gain access to education. As for now, South Sudan ranks very low among developing nations in terms of primary school enrolment. Although efforts to guarantee free primary education to South Sudanese children have been made, around 1.3 million children of primary school age are still out of school. Many of them engage in labour activities, mostly in subsistence farming. Because of widespread poverty, families often depend on the additional income their children generate. Since South Sudan is a very young state, accurate orphan statistics do not yet exist. However, both Sudan and South Sudan taken together are home to around 2 million orphaned children. The vast majority of them have been orphaned as a result of extreme poverty, ethnic conflict and HIV/AIDS.